People with vision impairments can measure their blood sugar with the Prodigy Voice Talking Glucometer! The Prodigy Voice is the only meter to receive the Access Award from the American Foundation for the Blind (AFB) and an Access Plus Award from the National Federation of the Blind (NFB). The Access Plus Award is only given to products that give blind patients the same usability that a sighted person would have. The Prodigy Voice is fully audible, both in setup mode and during testing, and has tactile features for ease of use and navigation. Prodigy Voice requires no coding, and once a test strip is inserted, the machine powers on automatically. The Prodigy voice also has an audio jack for discreet use of the talking function, as well as a USB port to download reading results. The Prodigy Voice is available online for around $40. 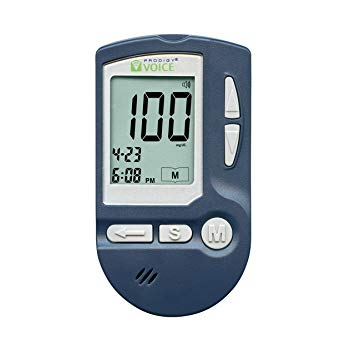 For more information, check out the web page for the Prodigy Voice through this link: http://www.prodigymeter.com/health-care-professionals/diabetic-supplies/prodigy-voice-talking-glucose-meter/. The Prodigy Voice can be purchased on Amazon through this link: https://www.amazon.com/Prodigy-Voice-Totally-Audible-Vision/dp/B004DJG0VW?SubscriptionId=AKIAJ2RJRL2O5UPIY6LA&tag=cs-blog-20&linkCode=xm2&camp=2025&creative=165953&creativeASIN=B004DJG0VW&ascsubtag=blood-glucose-meters. Everyone has limited budgets and needs their dollars to stretch further than ever before. But as more technology becomes available individuals, school systems, providers, etc have a hard time keeping pace. Thank goodness for AT Discount Sales and Services and the founder, Amanda Cheong. Amanda truly believes in the power assistive technology offers individuals with disabilities for a better quality of life and more independence. She founded AT Discount Sales & Services as a way to help get that needed AT into people’s hands. Their mission is to provide product information and available discounts on assistive technology and related products as well as services for schools, organizations, families and community agencies serving individuals with disabilities. You tell Amanda what you need, and she finds the best price or discount for you! Who doesn’t want the best price for equipment?? Amanda isn’t just bringing her 19 years at AT experience to the table. Her dedication and passion for the field grew out of her experience of witnessing how her daughter, Kristin, and countless others she has been involved with have been able to improve their participation with their families, peers, and studies through assistive technology. The State of Maryland is hiring a IT Accessibility Coordinator. This position will be co-located between MD Technology Assistance Program (MDTAP) and the Department of Information Technology (DoIT). The state is seeking an experienced IT accessibility specialist who can help state agencies select the most accessible products and systems and help provide accessible solutions to existing state technology. The IT Accessibility Coordinator will provide technical assistance with identified DoIT staff to ensure that State information technology services and systems are accessible to people with disabilities. Specifically, this position is responsible for identifying potential accessibility issues and compliance violations and coordinating solutions with State agency IT and/or procurement staff. The position involves providing training and creating guidelines to be used by procurement and/or IT staff. People with vision impairments can measure their body temperature, or take the temperature of a child, with the Advocate Infrared Thermometer! No sight is needed to use the Advocate because it reads the temperature reading out loud through a speaker. The thermometer is used by simply holding the device 2-3.75 inches away from a person’s forehead, pressing a button, and the body temperature reading is spoken in English or Spanish in less than one second. This method is convenient and more hygienic because the thermometer does not need to come in contact with the person who may be sick. The thermometer can even measure the ambient temperature of a room. The Advocate is less than 6 inches long and a storage case is included. 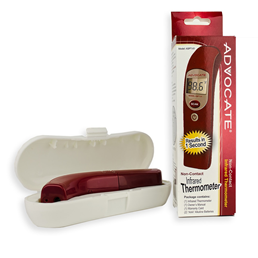 The Advocate Infrared Thermometer retails at $29.99 but can be purchased for as little as $20.49 through Overstock.com. For more information, check out the Advocate Infrared Thermometer’s website: https://advocatemeters.com/advocate-non-contact-infrared-thermometer/. It’s with mixed emotions that we announce that Jim McCarthy is leaving the Maryland Technology Assistance Program. MDOD Secretary Carol Beatty has appointed Lori Markland as the Acting Executive Director of MD TAP effective 2/27. Jim has served as the Executive Director of MDTAP for 5 years, and will now be working with the Federal Rehabilitation Services Administration, joining the team that provides federal guidance to the Randolph-Sheppard Program of blind vendors. We’re all sorry to see him leave, but know that he’ll make a great contribution to this program. Our loss is surely their gain. Lori Markland has been with the State for approximately 17 years and is currently the Director of Access Maryland and Accessibility Programs for MDTAP. She also served as the Communications Manager for Maryland ABLE, an investment plan for people with disabilities. With extensive experience in the disability field, communications, marketing, and program management, Lori has a breadth of experience related to assistive technology, disability services, and accessible information technology. She holds a BA and MFA from the University of Baltimore. The wealth of experience and knowledge she brings to the position will help ensure that MD TAP continues to serve people throughout the state without any disruption. 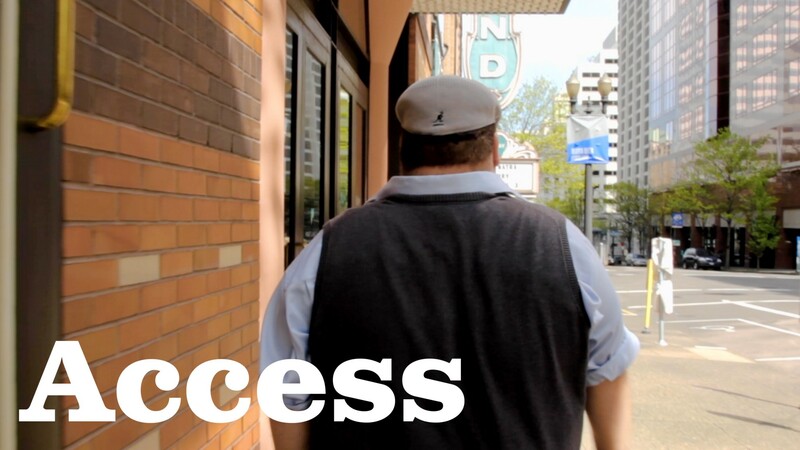 Check out this awesome guy, Chris Higgins, and his film “Access”.